Farm Fresh Direct has been trading in vegetables, both on the local market and across the border, since 2015. 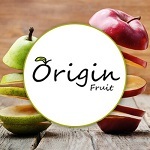 Their current onion trade with a UK retailer is their first foray into exports, managed by Vincent Keesenberg of Origin Fruit, the fruit division of Farm Fresh Direct. “We’ve sent out 40 containers so far, much more than in the past,” says Dawie Visser, managing director of Farm Fresh Direct. Europe and the UK are looking for large brown and red onions; of the latter South Africa can’t supply much because of limited shelf life. 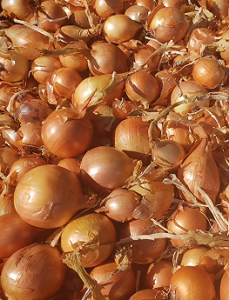 The brown onions grown in the Cape are of very high quality, making up 95% of the greatly increased onion exports of this season. The big focus of Farm Fresh Direct’s new export orientation lies in Africa, the market that excites them most. South Africa’s apple and pear trade in Africa is already extensive, going to all of the neighbouring countries and further north: Zambia, Tanzania, Kenya, Nigeria and the Ivory Coast. Apples, pears and citrus form the basis of their fruit exports and imports during the off-season, apart from their original core of vegetable trade (like onions to Zambia and Mozambique) or unusual assignments like possibly bringing in mangoes and litchis from Israel by air. They have noticed, for instance, interest in Pink Lady and novas from Angola (African clients don’t want satsumas because shelf life is paramount). 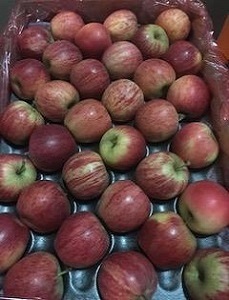 Opening volumes of Pink Lady will be sent by air to landlocked markets in central Africa as well as to some of the neighbouring Indian Ocean islands like Mauritius. One of their producers has the earliest novas in the country, they say, coming in two to three weeks before the rest. They’ve arranged delivery with clients in Malaysia and Singapore, while also noting how strong Vietnam is becoming as a destination. Soft citrus is on time, but lemons and grapefruit are slightly behind schedule, the same as the vegetable season, Dawie notes, perhaps because of the hot summer temperatures of December and January. As for lemons, Vincent notes that marketing is currently led by high prices in Russia, as much as $6 or $7 higher than in the Middle East and Far East. “Everyone’s screaming for lemons,” he says, but in the same breath, he also points out how quickly the market can become saturated. The local industry is exporting more class 2 lemons than previously, because the export price for class twos is currently higher than the domestic price. They are in an expansion phase, looking for new producers. Fortunately for them, it seems that some producers are also in the market for new representation. 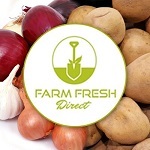 Farm Fresh Direct offers a fixed price before the product leaves, paying the producer 50% upon copy of shipping documents and 50% upon arrival at the destination, dependent on quality. “Our big draw card is the terms that we offer. We take 5% in commission, we charge no bank costs, and producers are paid within 6 to 7 weeks, for export fruit,” Dawie explains, pointing out that African trade is cash trade. As for domestic transactions, they are, as APAC-registered agents, bound by the rule that agents may not hold a producer’s money for longer than five days in cash transactions. Vincent adds that many farmers are just tired of the pool marketing system, whereby fruit from different producers are pooled together to reach an average price. In this way, very early or very late producers lose out on their strategic advantage. The company has been trading in vegetables since 2015, acting as a market agent on the online fresh produce trading platform FGX. On the local market they offer producers the advantage of fixed supermarket programmes, reducing their dependence on municipal markets, as well as assisting producers in obtaining all of the accreditations increasingly required by South African supermarkets.